Welcome to the another edition of PuzzleNation App Reviews! Today we continue our quest to explore the world of puzzly games and apps for your tablet or smartphone! 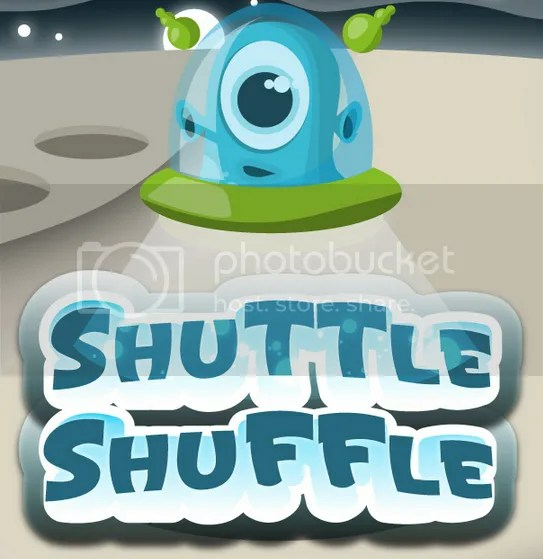 Our resident app player and puzzle fiend Sherri has a new game for us today, so let’s get down to business and dive into her review of Shuttle Shuffle for iPhone and Android! Shuttle Shuffle is a game where the goal is to return stranded aliens to their spaceships, so they can go home. Hello, humans, your goal is to help the aliens get back to their ships! They need to leave the planet at once. Won’t you please guide them? This is really cute twist on a clear-the-board type game. 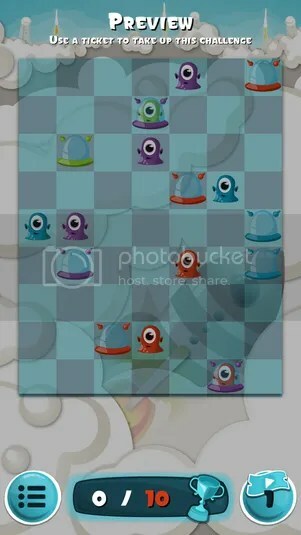 Your goal is to clear the aliens from the board by matching them to spaceships of the same color as the aliens. To move them, simply touch an alien and move up, down, left, or right. However, it isn’t quite that simple, as a column of aliens will move up or down together, and a row of aliens will move left or right together. This can make earning the medals and stars tricky. There is also a social aspect to the game. When you earn medals, you have a choice of earning a tickets to challenge another player or a ticket to make your own board with which to challenge another player. This adds a nice twist to the game. This is a really enjoyable game. For fans of this type of game, it is highly recommended. This will keep you puzzling for ages. Enjoyability: 3/5 — This is really fun and quite challenging! Trying to earn the medals and stars really takes thought. 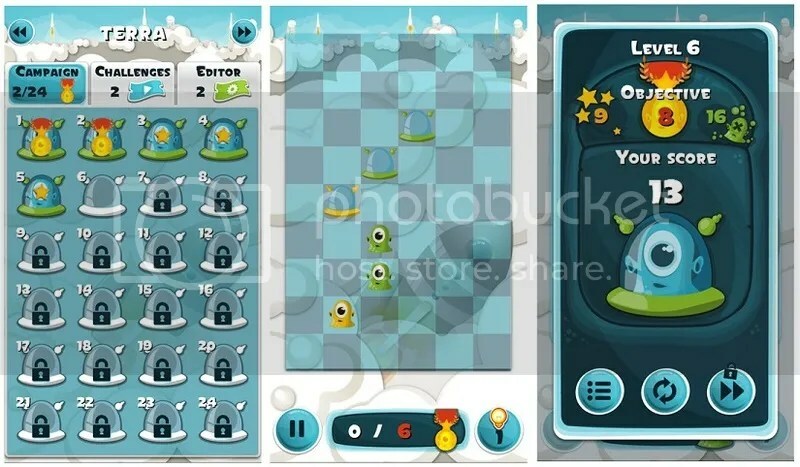 Puzzle incorporation: 3/5 — In each level, you have to puzzle out how to get the aliens to their ships, each level with its own layout of aliens, which often provides a chain-solving challenge. Graphics: 4/5 — Except for the blinking eyeball, the graphics are static, but they are very bright and colorful. You move the aliens along a standard grid, and the background of the first world, Terra, features clouds and spaceships launching. Gameplay: 4/5 — This is a really cute twist on a clear-the-board game. The aliens are adorable, and the levels get increasingly more difficult, so you really have to think to earn the medals and stars. Plus, the social aspect of designing your own levels adds an extra dimension to the game. Thanks for visiting PuzzleNation Blog today! You can share your pictures with us on Instagram, friend us on Facebook, check us out on Twitter, Pinterest, and Tumblr, and be sure to check out the growing library of PuzzleNation apps and games! The Conclusion of Brain Teaser Week! Welcome to Brain Teaser Week! Our Annual TableTop Tournament Starts Next Week! Delving into the 2019 ACPT Puzzles! PuzzleNation.com The place to go for puzzle apps created by puzzle lovers for puzzle lovers.